Netaâ€™s of India â€“ The most corrupt lot! Transparency International recently released the Global corruption barometer for 2009 – it reveals that our Indian Neta’s for whom we cast our all important votes are the MOST corrupt lot, even more than Police and law officials ! 58% of the respondents in India singled out politicians as the most corrupt individuals. 13% of the respondents rated government officials as the second most corrupt. 10% of the respondents felt that Parliament and other law making bodies are corrupt. 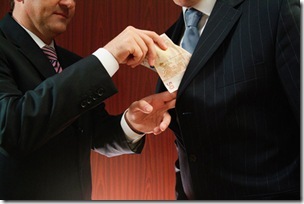 9% of the respondents felt that the private sector – which was included in the survey for the first time – are corrupt. Media and judiciary are corrupt in the view of 8% and 3% respondents respectively. 45% of people surveyed in India said the government is ineffective in addressing corruption. I actually do not understand the last finding “45% of people surveyed in India said the government is ineffective in addressing corruption” . Tell me, if the people who run the government are the most corrupt, then how in the hell can they do anything about corruption!! Here is another interesting finding of the survey- Poorest families continue to be punished by petty bribe demands. Across the board, low-income people were more likely to be met with bribe demands than high-income ones. Yes. The government of India has been trying to bring the bill for corruption since more than 10 years. The corrupt politicians vehemently opposed and ensured the bill was not passed first to save themselves. We have famous politicians like Lalu Prasad, Mayathi, and the money they have swindled is well known to everyone. It is a shame that the government is unable to take action against such people. When Anna Hazare stood firm about the bill, the government is trying to smear Anna and his team, just to distract the attention of the public. Now the latest is the government’s action against Bedi. When we have a bunch of corrupt politicians, we cannot dream the bill will be passed in the near future. Now the latest is the government's action against Bedi. Not just the netas to be qualified, but, the people as whole should be qualified. Because if you see, people are to be blamed for all the mess. People select these politicians and send them to cabinet. The politician knows this that the people of this country are fool. Because even if they are criminals, uneducated , corrupt, they are getting elected if not this time then next time. Actually it is hard to believe that even while selecting a servant for the house people take interviews and know the profile of the applicant, where as when it comes to select the person to safeguard and for the progress on country, people cast their vote very very casually. Huge population in the villages do not know what is the minister are suppose to do and what he has done in the past. Even now people vole on the name of cast, religion and status. Nothing can change unless people starts thinking about the profile of candidate and not just their speech (bhasan). I am Ph.D Student of Economics . I feel very much How much of money politican and others took . Political persons are understand or not I dont no But I feel daily this is our country .Here How many poor peoples are there . We have to face so many problems daily in our country. (there is no praper house, education, food , electricity, water, road, employment, and other Basic needs .One day definately change theses things . So we are study first. My dreams without poor we live our country people . My suggestion means corruption is every place and every department has going on . we creat corruption first we should not gave to money. First upall peoples wants more awarness without knolowdge we can not remove corruption. Becuase every place we should fight.Like RDO office, Government Admini office, every department we should follow right way . So basically peoples want more awarness in our country . my dear in india 89.7% crime spread due to corrupt politicians.in loksabha 412 seats filled with crimlist politicians and their degrees are bca(bachlor of crime application),mca(master of crime application). I am an Indian Singaporean. I tell my family and friends in India about how our PM really put corrupt people (anybody) in jail when Singapore became independent. In 1965, our government put rubbish bins every few meters and fined anyone who threw litter on the floor. Now, it is automatic. thousands of Indian tourists come to singapore but almost none of them litter the streets. In China, when you see the government shoot corrupt top officials in the head, people pee in their pants and keep their hands in their pockets. My people in India always say that india is too big. How big is the US? A lot of countries like singapore and US lack certain skilled people. they swallow their nationalistic pride and outsource. I say to India and Indians, outsource the government of India for a while. Bear the shame and see if it works. Put your pride aside for a while and Save the suffering millions in India. There is a lot to love about India but my 45 year love affair with Bharat is coming to an end soon because Indians lack the will. I have family and property In India and hope when my son is older he will have a beautiful, clean, well run and corruption free India to go to. Yes, India needs a revolution. sir ,i think bribery mainly holds the account of corruption.so if by some means bribery is stopped the purpose is solved.if we stop the printing of big notes then we can halt bribery to a great extent.only currency till hundered rupee note should be printed.an ordinary person is very comfortable within this range.higher currency notes facilitate bribery of big amounts and moreover it will make difficult to transport heavy amounts of bribery. i thank the people who rose against corruption. like that of most european countries there should be revolution in india. thank you for your comments. we have to think a way out. politicians are the cancer of the country. the should have no hold over the executives . Why should anyone spend his time and money and become an MP or MLA if he is not getting his investments back? Why some govt. official select your bid in the tender if he is not getting any money from you? Why would he think about quality of work when he is getting a meager salary and living costs are increasing? Sometimes I feel it is people like us, who abhor corruption, who are to blame in part. We turn a blind eye, wonder whether we will ever bribe a person or not, and then when the pressing need comes up, part with the little money under the table. Meanwhile, hating the politicians and the ‘Govt Job’ workers, we dont want to be one of them. Once this escalates to a nationwide scale, who do we see applying for these posts? People who dont mind being corrupt. Vicious Cycle? Yes. Not to say that one person joining the sarkari naukri will help the world, but then neither will ‘i never and will never apply for a govt. job’ help the world. I wonder who will find a way out of this chicken-and-egg scene. Exactly @Chaudhary and that is precisely the reason why I decided that this post can just be an information post not a analysis one – ANyway you look at it, its not easy for INdia to do away with corruption…. Join My Mission Clean India at http://www.mymissioncleanindia.com your fight against corruption where you can comment, blog, news, poll, video, photo, write article and share with your friends. I agree that a solution is far streched Arun.But frankly, after reading Freakonomics, i am confident that there is a soltuion lurking in dark.What it does need is a major change in the thought process.But then, we humans are so averse to change, it again makes it unlikely. Education is by far the only feasible solution in sight.Netas as well as the aam junta.It is saddening to hear that all it takes for people to vote is a sweet/hate talk. If the varun gandhi episode was anything to go by, i have bleak hopes for any positive change in near future. PS:: this is one big reason, i never and will never apply for a govt. job no matter how gruesome working for an MNC is. Arun, surveys or no surveys, it is a no-brainer that the supposedly khadi clad neta is the most corrupt.But then, do we have a solution.Cos if we point a finger towards them,4 will be pointed towards the aam junta who elects them in the first place. It’s another matter where the aam junta is now subjected to choose between a lesser corrupt or a more corrupt leader. I figure lack of education and ethics in the neta breed is a major factor.I dont have stats to support my viewpoint, but i figure a US like strategy where there is a madante to serve in the armed forces can help imbibe some moral ethics. Ankit, you know I was going to write my analysis on corruption, but I stopped at writing only an informative kind of post – do you know why? Because, honestly I dont see a solution in sight (If there is, it is extremely difficult to implement). Having said that, I firmly believe that Education and only Education can improve things to a certain extent. Our majority of Neta’s are not even graduates, and the most of them come from criminal background. They do not have a word called “ethics” in their dictionary. The only word that rules is “Money”. Also, it is a vicious cycle – to get elected they spend money so that they can earn more money when they are in seat. And, to say the least, the biggest reason for corruption is because common people give it. They are not ready to face the difficulties of getting work done without bribing – they take the easiest route and thats where corruption starts. Arun, I do not completely agree that common people are the most corrupt; My reason is that for every work done, there is a set process to be followed, and most all (literate and illeterate equally) are fairly ignorant about that and there is nobody whom they can approach to get the understanding of the process. Where they can hope to get some understanding, they can be vulnerable. So, people are extorted for their process ignorance. The difficulty is not about the readiness to face it, rather the perception that is made out of it by the people who need to educate them about the process. So, my point/solution is education or literacy is not the only saviour. Process and People Accountability and awareness combined is the mantra. As for corrupt netas, it is again accountability and transparency, but if netas were expected to make such laws at this juncture, God save the country ! See Raja holds an LLB degree. Madhu Koda was a graduate.